Samsung launched Good Lock 2019 with support for OneUI and Android Pie last month, and now the company is hard at work on refining the experience with its customization app even further. The most recent update was published in the Galaxy Store app earlier this week, and it brings a plethora of improvements for every single component in Google Lock. As you can see in the screenshot attached to the article, there are new refinements for LockStar, QuickStar, TaskChanger, and NavStar, and the changelog points to both additional features and bug fixes. 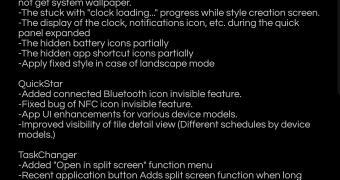 For example, the updated LockStar version resolves a bug hitting the battery icons and addresses a glitch that caused the status bar to overlap with the front camera. QuickStar, on the other hand, adds connected Bluetooth icon invisible feature, while also bringing app UI enhancement for several Samsung models.